Just a reminder to all and sundry that if the dates of August 15 through 17 are just a big ol’ gapin’ hole in your social calendar, there’s something you can do about it, namely, come to Austin, Texas and hang out with me, Joe & Gay Haldeman and lots and lots of other truly excellent folks at ArmadilloCon 30. This will be my first time in Texas, save being trapped inside of an airport, so you know you don’t want to miss that. In all seriousness, this looks like it’s going to be a hell of a lot of fun, so if you can make it, it’ll be great to see you there. For those of you hoping to pick up a copy of Zoe’s Tale via the Science Fiction Book Club, I have some bad news, which is that SFBC won’t be carrying it. The reason for this is fairly uncomplicated: they made an offer for it which we felt wasn’t acceptable, so we didn’t accept it. This was a little sad for me — the OMW books had done pretty well in their SFBC editions, and I liked having them there — but that’s business sometimes. It will, of course, be available just about anywhere else hardcover books are sold, so it won’t be like you won’t be able to find it otherwise. So that’s good. In any event, just a head’s up for you SFBC subscribers. 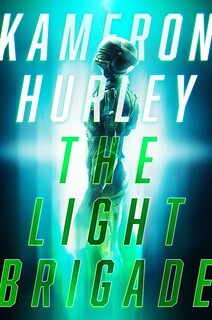 If you like your science fiction hard — we’re talking diamond-scratching hard, here — then you already know that Greg Egan is your man; this Hugo winner’s been spinning tales of hard SF for years that make you think and thrill at the same time. 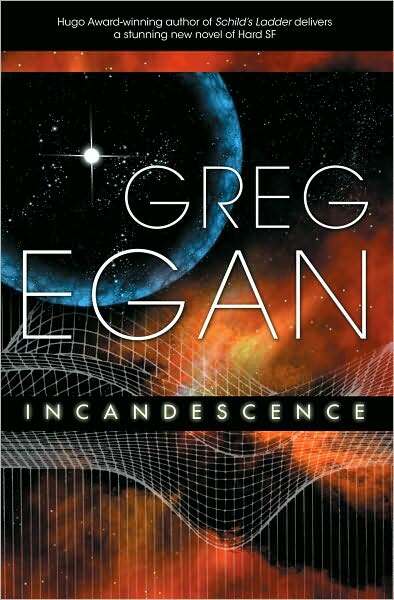 After a six-year break from novels, Egan is back with Incandescence, which features a journey to the very core of the galaxy. You know, like you do. And for those of you who are wondering just how seriously Egan takes the “science” part of the phrase “science fiction,” here’s Egan to explain the genesis of Incandescence, which involves Einstein’s greatest discovery, and how people who aren’t exactly Einsteins themselves might discover it. Incandescence grew out of the notion that the theory of general relativity — widely regarded as one of the pinnacles of human intellectual achievement — could be discovered by a pre-industrial civilization with no steam engines, no electric lights, no radio transmitters, and absolutely no tradition of astronomy. At first glance, this premise might strike you as a little hard to believe. We humans came to a detailed understanding of gravity after centuries of painstaking astronomical observations, most crucially of the motions of the planets across the sky. Johannes Kepler found that these observations could be explained if the planets moved around the sun along elliptical orbits, with the square of the orbital period proportional to the cube of the length of the longest axis of the ellipse. Newton showed that just such a motion would arise from a universal attraction between bodies that was inversely proportional to the square of the distance between them. That hypothesis was a close enough approximation to the truth to survive for more than three centuries. When Newton was finally overthrown by Einstein, the birth of the new theory owed much less to the astronomical facts it could explain — such as a puzzling drift in the point where Mercury made its closest approach to the sun — than to an elegant theory of electromagnetism that had arisen more or less independently of ideas about gravity. Electrostatic and magnetic effects had been unified by James Clerk Maxwell, but Maxwell’s equations only offered one value for the speed of light, however you happened to be moving when you measured it. Making sense of this fact led Einstein first to special relativity, in which the geometry of space-time had the unvarying speed of light built into it, then general relativity, in which the curvature of the same geometry accounted for the motion of objects free-falling through space. So for us, astronomy was crucial even to reach as far as Newton, and postulating Einstein’s theory — let alone validating it to high precision, with atomic clocks on satellites and observations of pulsar orbits — depended on a wealth of other ideas and technologies. How, then, could my alien civilization possibly reach the same conceptual heights, when they were armed with none of these apparent prerequisites? The short answer is that they would need to be living in just the right environment: the accretion disk of a large black hole. When SF readers think of the experience of being close to a black hole, the phenomena that most easily come to mind are those that are most exotic from our own perspective: time dilation, gravitational blue-shifts, and massive distortions of the view of the sky. But those are all a matter of making astronomical observations, or at least arranging some kind of comparison between the near-black-hole experience and the experience of other beings who have kept their distance. My aliens would probably need to be sheltering deep inside some rocky structure to protect them from the radiation of the accretion disk — and the glow of the disk itself would also render astronomy immensely difficult. Blind to the heavens, how could they come to learn anything at all about gravity, let alone the subtleties of general relativity? After all, didn’t Einstein tell us that if we’re free-falling, weightless, in a windowless elevator, gravity itself becomes impossible to detect? Not quite! To render its passenger completely oblivious to gravity, not only does the elevator need to be small, but the passenger’s observations need to be curtailed in time just as surely as they’re limited in space. Given time, gravity makes its mark. Forget about black holes for a moment: even inside a windowless space station orbiting the Earth, you could easily prove that you were not just drifting through interstellar space, light-years from the nearest planet. How? Put on your space suit, and pump out all the station’s air. Then fill the station with small objects — paper clips, pens, whatever — being careful to place them initially at rest with respect to the walls. Wait, and see what happens. Most objects will eventually hit the walls; the exact proportion will depend on the station’s spin. But however the station is or isn’t spinning, some objects will undergo a cyclic motion, moving back and forth, all with the same period. That period is the orbital period of the space station around the Earth. The paper clips and pens that are moving back and forth inside the station are following orbits that are inclined at a very small angle to the orbit of the station’s center of mass. Twice in every orbit, the two paths cross, and the paper clip passes through the center of the space station. Then it moves away, reaches the point of greatest separation of the orbits, then turns around and comes back. This minuscule difference in orbits is enough to reveal the fact that you’re not drifting in interstellar space. A sufficiently delicate spring balance could reveal the tiny “tidal gravitational force” that is another way of thinking about exactly the same thing, but unless the orbital period was very long, you could stick with the technology-free approach and just watch and wait. A range of simple experiments like this — none of them much harder than those conducted by Galileo and his contemporaries — were the solution to my aliens’ need to catch up with Newton. But catching up with Einstein? Surely that was beyond hope? I thought it might be, until I sat down and did some detailed calculations. It turned out that, close to a black hole, the differences between Newton’s and Einstein’s predictions would easily be big enough for anyone to spot without sophisticated instrumentation. What about sophisticated mathematics? The geometry of general relativity isn’t trivial, but much of its difficulty, for us, revolves around the need to dispose of our preconceptions. By putting my aliens in a world of curved and twisted tunnels, rather than the flat, almost Euclidean landscape of a patch of planetary surface, they came better prepared for the need to cope with a space-time geometry that also twisted and curved. The result was an alternative, low-tech path into some of the most beautiful truths we’ve yet discovered about the universe. To add to the drama, though, there needed to be a sense of urgency; the intellectual progress of the aliens had to be a matter of life and death. But having already put them beside a black hole, danger was never going to be far behind. Visit Greg Egan’s Incandescence page, which features quite a lot of supplementary material. 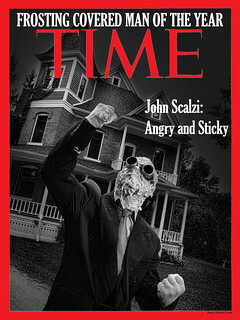 Also visit his listing of his works available online.